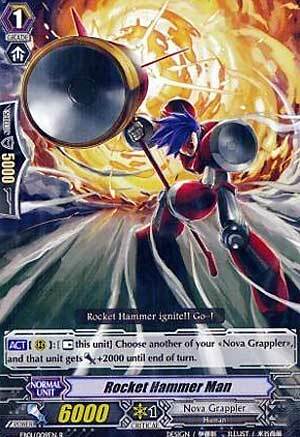 [ACT](RC):[Rest] this unit] Choose another of your «Nova Grappler», and that unit gets [Power] +2000 until end of turn. ...so now we have a unit that has the same effect as Cosmo Roar from Dimension Police. However, along with a corny name, this card just doesn't cut it. It's base stats are mediocre at 6,000 and the effect leaves nothing to amaze when resolved. The 2,000 boost isn't enough to make a huge guard difference in the long run unless there's a strong booster behind the one that's getting the minuet boost to begin with. In short, a very underwhelming card. Next Time: IT'S TOO BRIGHT!!! IT BURNS!! !